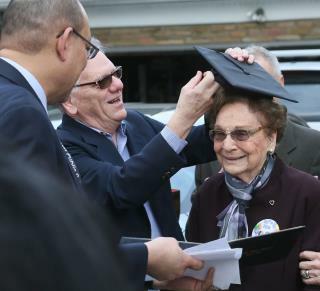 (Newser) – An Ohio woman expelled from high school just weeks before graduation after it was discovered she was married finally got her diploma—on her 93rd birthday, Jezebel reports. According to the Akron Beacon Journal, Dorothy Louise Liggett secretly married her husband after he was drafted into the Army in 1942. But when she accidentally let that fact slip during gym class, North High School in Akron followed school policy and kicked her out. She lived the rest of her life regretting not graduating. Now she can go on to college and have random hook-ups like the rest of them! weird rule about the marriage thing. Just think if the standards were still the same....we didn't have anyone married in our senior class but we did have about 8 pregnant chicks. WHY IN HELL would they expel someone just because they got married?!!? That doesn't make any damn sense!!!! That's just ridiculous!!!!!!! !